iJoy Elite Mini AIO 60W Starter Kit that integrates three different vape styles. 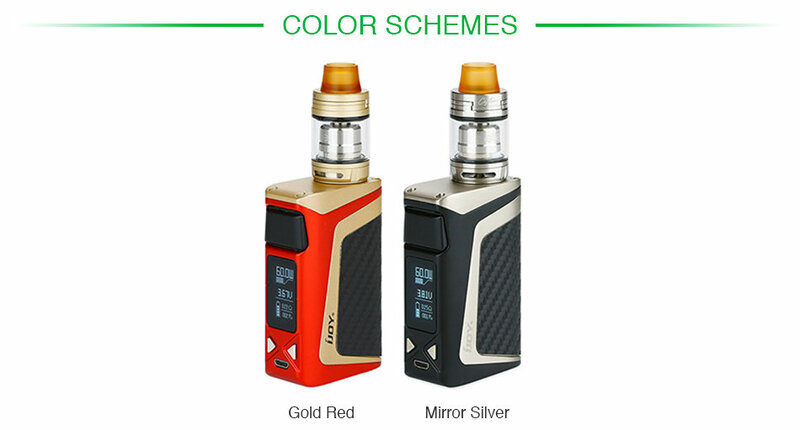 The Elite Mini is the latest starter kit by iJoy, powered by built-in 2200mAh battery and maximum output reached to 60W for best MTL flavors. Elite Mini Kit is compact design, featuring a portable size and several colors for option. Elite Mini box mods are integrated ergonomic design and large fire button for great vaping experience. Elite Mini Mod matches with IJOY Captain Elite Sub Ohm & RTA Tank that is a 3 in 1 vape kit, to provide you subohm & RTA & pod system! Captain Elite adopts large 3ml e juice capacity by its bubble glass tube. It is compatible with Juul and Phix pods. With the J&P (Juul & Phix) Pod Adapter, not only can you use your pods on a mod with long battery life, but also you can do some wattage setting adjustments.